First and foremost, I must confess that I am a techie type person. I love, love, love gadgets, computers, and all things technology related because I can have access to so much information at my fingertips. I was very fortunate to grow up in a town that placed a pretty high value on technology, so I have been around computers for most of my life (I *DID* take a typing class on an electric typewriter in high school though). 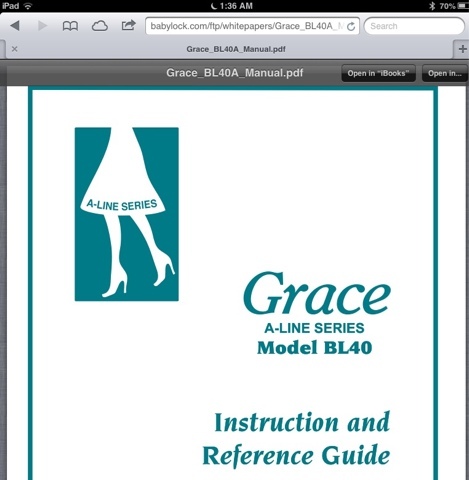 Many machine manufacturers offer their manuals for free download in Adobe's PDF format which is probably already installed on your computer. If not, you can download Adobe Reader for free on adobe.com. 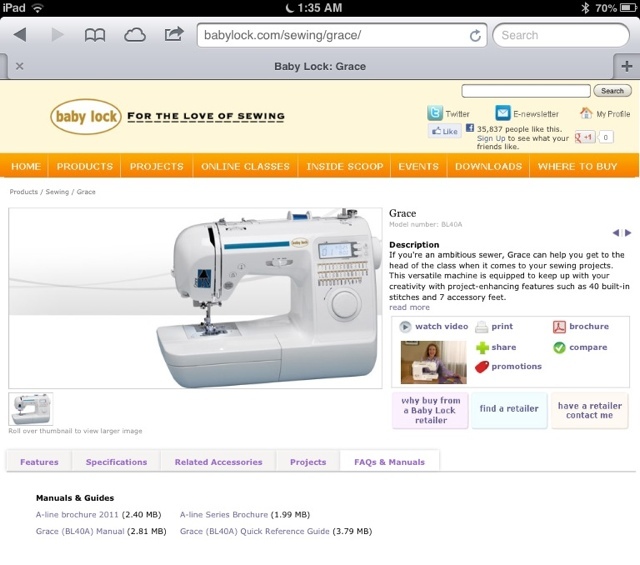 I have personally downloaded them from Baby Lock, Bernina, Brother, and Pfaff. If you have a machine that hasn't been made in this century, this will be harder to find. It can be done, it just might not be easy or free. If you open a PDF file on an iPhone/iPad, you will typically have the option to open the file in iBooks. When you do that, it will save the file (and it will sync back to your computer when you next sync with iTunes). One excellent benefit of going digital is that you can search within the file. If you have ever had to flip through your machine's manual, you'll probably quickly see the time saving benefits of the search function (especially when some of the manuals are 75-100 pages). Another benefit of having digital manuals is that you can zoom in to magnify the images or text. I have found the ability to zoom extremely handy when I'm trying to read the quick reference guide for my serger. Keeping a digital copy of your manual can also be great if you are prone to paper cuts like me. :) I also like to keep my manuals in as pristine of a condition as possible, so not dragging them around to classes is a great benefit. This is also super helpful if you have multiple machines. All of your manuals can go with you all the time. If you are an Apple user and have both an iPad and iPhone/iPod Touch, you can easily set the manuals to sync with both devices. If you have a Kindle Fire or use the Kindle for iOS app, you can also take advantage of the Send to Kindle plug in offered as a free download by Amazon. To download it, you need to go to 'My Account' then 'Manage My Kindle.' There will be a link to download the program. After you have that downloaded, you can select the file you wish to sync (single left mouse button click - you just want to highlight it, not open it) and then click the right mouse button once to open the menu. Pick Send to Kindle and a few minutes later, you'll be up and running! Another handy program that I really like is Good Reader which can be found here for iPhone or here for iPad. To my knowledge, this is just available for iOS devices, but I'm sure there are similar options for Android devices. If you don't want to worry about plugging your device in to sync it, you can always email the files to yourself. From email, you will likely have the option to open the file in another app like I mentioned earlier with iBooks, Good Reader, and a few others. Just remember that not all email accounts will accept very large files. The most important part of this is to make sure that you take your device with you to classes/retreats and to have it CHARGED! No power = no workie! There are a couple of pictures at the bottom of the post showing some of these steps (yes, I really was doing this at 1:30 am. The last one showing 3:00 am was just because of the switch to daylight saving time). There are a couple of ways to manage your thread digitally. I use a program for embroidery called 5D. In 5D, you can use the Thread Manager program with 5D Configure to print out a list of all of the thread you have entered (I'm sure other embroidery software programs have a similar feature). Instead of using your printer, you can set up a virtual printer using Windows 8, the free program PrimoPDF, or even using Microsoft's OneNote. If you print the thread chart to a PDF file, you can then use iBooks/Send to Kindle/Good Reader to get the file on your phone/tablet device. If you do not have a built in thread manager program, I would recommend Microsoft's OneNote. I believe that it is free on your PC if you own Microsoft Office and can sync wirelessly with the OneNote app for iPhone, OneNote for iPad, or Windows Phone. I use OneNote to manage my list of serger threads. OneNote works great for me because I can view and edit the same file on my computer, iPhone, or iPad. 3. What about all of those stubborn embroidery files? I think this is probably the most painful suggestion that I will make. I have been trying to figure out the best way to deal with all of these embroidery designs that I've downloaded. Normally, as you may have discovered, you download your purchased design only to find out that you have no idea what it is called! Bummer! For the sites that I use, I am provided with a .zip file containing the designs. After I extract the files from the .zip archive, I manually check each file and then rename them with something that tells me what they are. That way I can easily locate the file I want. 100812a just doesn't scream "Awesome Sock Monkey design" to me. It might to you, but it just doesn't work for me. As I said earlier, this is probably the most painful suggestion at all, especially if you have been doing embroidery because you have to go back and rename all of the files. Ugh. Not fun. Perhaps it is a project best tackled in spurts. 4. I have lots of fabric. Yeah, me too. How do I keep track of it? That is a very good question and currently it has me at my wit's end. I am frustrated with a capital F on how to manage my fabric stash. Right now I have it all entered in to a Microsoft Excel spreadsheet on my computer so I can log the fabric part number, designer/manufacturer, collection name, where I bought it, and when I bought it. It will give me a head start if I ever need to find the fabric again. That gives me some searchable information but no pictures. I'm working hard on brainstorming a good solution, so I'll keep you posted on how that goes. 5. I have lots of patterns. Patterns aren't quite as problematic for me as fabric. With a pattern, you have a couple of different options. You can use a computer scanner and scan the front and back of the pattern envelope or you can use your camera (either a digital camera or a camera on a smartphone) to take a picture of the envelope. You can manage those pictures online using a program like Evernote (I've never used it, but I've heard it is good) and Evernote for iPhone/iPad, DropBox (haven't used it either) and DropBox for iPhone/iPad, or Microsoft's SkyDrive (this is what I use). I am currently using a box designed to hold greeting cards to store my patterns in their envelopes. UPDATED on 3/14/13: I also recently discovered on that I can store a list of my patterns that I own on patternreview.com. It gives me easy access to reviews written about those patterns from other PR members. It wouldn't stop me from using one of the other methods for managing patterns because you don't have the images of the pattern envelopes, but it is nice to be able to access the information from my smartphone so I don't wind up buying the same pattern twice. To wrap up, these are just a few of the ways that you can make technology work for you. This list is by no means the only way to handle these types of issues. These are ways that have worked for me (and for some other people that I've spoken to). Please, please, please, please make sure that you are doing software backups. These are critical in the event of data loss due to many reasons. If you back up your data, someday you will probably learn the value of backups. They are easy to do and are inexpensive ways to protect your data. Also remember that new is not always bad. Some of these things might seem overwhelming and maybe even a little scary. It will be OK. I promise. Take baby steps. You can do it, but if you don't like my suggestions, don't do them. My feelings won't be hurt, but sometimes it can be hard to adjust to a new way of doing things. If you've actually read through all of this, you have a much longer attention span than I do. I'm always excited to figure out new ways to do stuff so if I've left anything out, let me know! 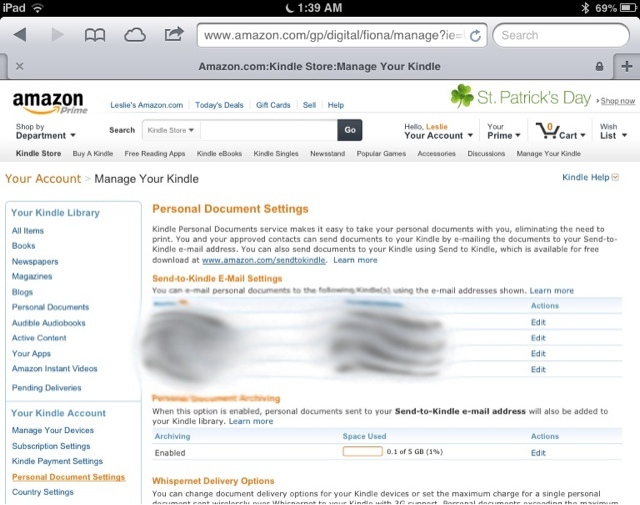 If you want to use Amazon's email to Kindle or Send to Kindle, select 'Personal Document Settings' on the left and either use the email address for your device (one of the black blobs in the middle of my screen) or use the download link for Send to Kindle. 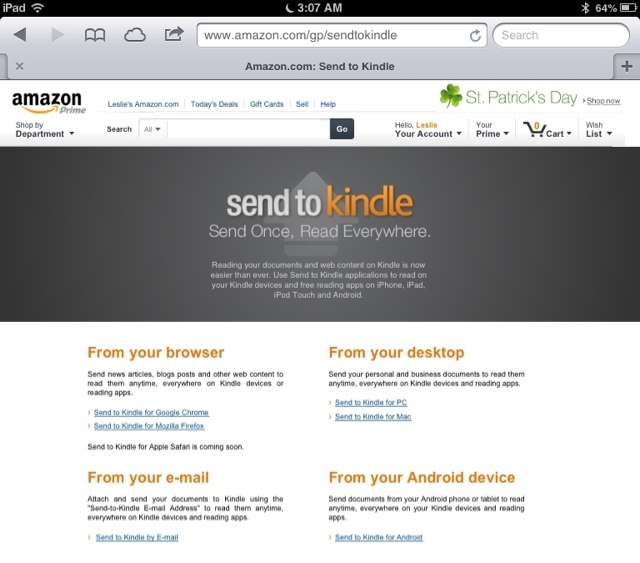 Here is the Send to Kindle download screen. How to read Kindle books on iPad? You need to download the Amazon Kindle app for iPad that is available on the App Store on your iPad. Hope that helps!